Square Enix details new features. Square Enix released English details today surrounding Final Fantasy XIII-2‘s Historia Crux (known in Japan as “Historiacross”) system and Lightning’s role in the game (vita Square Enix blog 1, 2, 3). 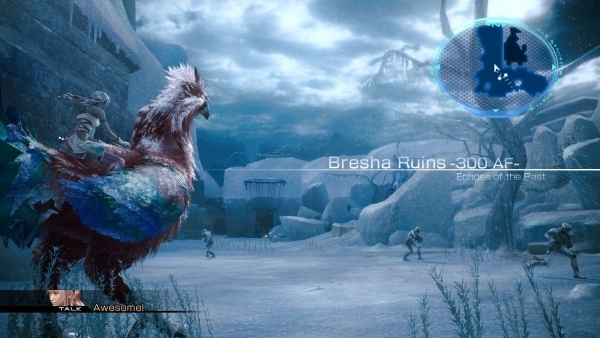 Historia Crux allows players to travel to different locations and time periods, and is the “basis” of the Final Fantasy XIII-2‘s world navigation system. Artefacts (O-Parts in Japanese) hidden across the game world allow players to unlock specific gates, which will either transport Noel and Serah to a different location or to a different time period. The course of the game and the items you receive will change depending on when you visit these areas. Players will have to perform certain actions in different time periods to change the future or past. According to game director Motomu Toriyama, it’s just one of the ways Square Enix is assessing a non-linear approach. Player choice is a heavy variable with Historia Crux. “The Historia Crux branches off into multiple different routes depending on the player’s choices. You will be able to take a detour into areas that have branched off of the route you have taken, perform side missions and turn back time in each of the areas to experiment with all possibilities. It is of course also possible to progress simply following the main story, like in the original Final Fantasy XIII. The flow of areas accessible via Historia Crux has been structured so that all of the player’s actions and decisions will influence the gameplay. Noel Kreiss, Final Fantasy XIII-2‘s new protagonist, is from a future time where’s the last remaining survivor of a race wiped out. To change the events of his unfortunate present, he travels back in time. Noel meets Serah at the very beginning of Final Fantasy XIII-2, after a meteor lands near her and Team NORA’s home. “Come with me across the boundaries of time”, Noel says. “Your sister is waiting”. If you haven’t completed Final Fantasy XIII-2, this section may contain spoilers. At the end of Final Fantasy XIII, Lightning saves Serah from her crystallized state and saves the world. Since then, she’s left the world to become the protector of the Goddess Etro in Valhalla, “the land of Chaos.” When Lightning is unable to save Valhalla, she calls upon Noel for help.